Perfection is boring. At least, that’s the stance Lensbaby takes with its line of creative lenses that add intentional vignetting or put a literal spin on bokeh. And now, the Portland, OR based lens company has introduced it’s least expensive creative effects lens yet with the Lensbaby Sol 45. Designed for blurring everything but the subject, the Sol 45 produces a “sweet spot” of sharpness that can moved anywhere in the frame by tilting the lens. This is the original Lensbaby effect, but the Sol 45 does it for just $200, making it a great entryway into the world of creative effects lenses. Announced on August 7, the Lensbaby Sol 45 is a full-frame lens that also works on crop sensors, available in mounts for Canon EF, Nikon F, Sony A and E, Pentax K, Fujifilm X, and even Samsung NX mounts (may it rest in peace). (For this review, we used the Nikon D7200, a crop sensor camera). Lensbaby is also bringing a similar feature set to Micro Four Thirds cameras with the Sol 22, offering an equivalent focal length of 45mm. The Sol 22 will launch in September. Where traditional lens manufacturers work hard to keep a lens sharp from the center to the edges of the frame, edge blur is an imperfection that Lensbaby embraces with gusto with the Sol 45. But by tilting the lens, you can change what area of the frame is in focus and where the blur falls, so your subject can be anywhere in the frame. The Lensbaby Sol 45 bucks usual lens design in two primary ways: It can bend up, down, left, right, and anywhere in between, and it employs two aptly named “bokeh blades” that rest on hinges and be swung in to alter the quality of blur. Despite all of these moving parts, the lens remains unbelievably tiny and weighs around five ounces. Once mounted on a camera body, it only protrudes about an inch and, tucked away inside a bag, the lens requires less than a two-inch pocket to slide in. While the ability to reposition the sweet spot is a primary characteristic of the Sol, you can also lock the lens by twisting the front to keep the focus fixed in the center. As with other Lensbaby lenses, the design takes some getting used to. When mounting it to the camera, be careful to keep the lens locked and twist it fully into the mount before unlocking it. This process will become more natural over time. Twisting the narrower ring at the front of the lens controls the focus. Yes, like all Lensbaby lenses, the Sol 45 is entirely manual focus. This is part of the fun, but understandably may also b ea reason some people might be hesitant to pick it up. The lens also has a fixed f/3.5 aperture, which means there’s no aperture control ring to worry about, but it also means you’re completely reliant on shutter speed and ISO adjust exposure, nor can you change the size of the focus sweet spot like you can on other Lensbaby optics with that effect. Blur is something traditional lens manufacturers frown on, but it’s an imperfection that Lensbaby embraces. As for the bokeh blades, they tuck to the sides when not in use, allowing you to shoot with or without them, with just one or both, or with them only partially engaged. Pulling the blades out in front of the lens gives the bokeh a wavy texture and also creates an effective aperture of f/5. Nudging the knob where the blades are mounted on the camera will also rotate the blades 360-degrees around the lens, which allows you to change the orientation of the wavy bokeh. The design is what makes the Sol create unique images through optical trickery rather than digital manipulation. The downside is that all of this extra complication can take a while to get used to, and thinking about bokeh blades, tilt, and manual focus all at once can be a bit much for novice photographers who may otherwise be attracted to the Sol 45’s low price. Manual focus is both a positive and a negative for the the Sol 45. The lack of autofocus slows down your process, but slowing down is often what photographers need to put a little more thought into an image and thus end up with a better result. Combined with controlling the sweet spot, there are no quick snapshots with this lens, only careful compositions and — as long as you’re not shooting fast action — better photographs. While manual operation can be great for the creative process, manual focus is manual focus. Getting a sharp shot can be difficult depending on what you’re shooting. In a well-lit photo, a sharp photo just requires patience. In a dark scene or when trying to focus on an area in the shadow, sometimes even patience isn’t enough to spot the sharp edges in a dark area through a viewfinder. Live view will make the process easier, as you can punch in to a detailed view of the image to check focus, but this all but requires a tripod to work reliably. While manual operation can be great for the creative process, manual focus is still manual focus. The lens’s all-manual operation also limits the shooting modes that you can use with the camera. With the lens mounted on my Nikon D7200, the Lensbaby shows up as an “f/0.” Auto exposure and even shutter priority modes aren’t available. Aperture priority will work, and since the aperture is fixed, this mode serves as a sort of auto mode with the option to control the exposure using ISO and exposure compensation. The Sol 45 is a joy to shoot with in low stress scenarios. In more intense situations, the manual focus and limited exposure modes can create headaches in the shooting experience. What and how you shoot plays a role in how the Sol 45’s unusual effects show up. Shooting a landscape from a distance, the soft edges seem the most obvious, leading the eye towards the sharpest portion of the frame. The look and feel of the images reminds us of a few different photography tricks used to create intentional blur. Used with leading lines, like when standing in the middle of a road or a path, that blur creates a feeling of motion leading your eye into the frame. On closer subjects, with the lens’s 14-inch minimum focusing distance, images feel similar to a zoom burst, when you zoom during an exposure in order to create a radial blur pattern. Depending on where the subject falls, the Sol can also look like just a very wide aperture, the blur mimicking the look of a shallow depth of field. Using the bokeh blades, the texture gives the shots a unique background. Using the bokeh blades, the textured blur gives pictures a unique energy. Photographing stationary motorcycles, we found the images to have a sense of vibration, as if from the bikes, had the engines been running. While the Sol is designed for blur, it is impressively sharp within the sweet spot — provided you get the focus right. It’s certainly not the sharpest lens we’ve seen — nor would we expect it to be, it’s $200, after all — but it’s good enough to capture a decent amount of detail in your subject. The character of the blur is also unique and attractive, although in some instances it can be a bit distracting with elongated bokeh circles. 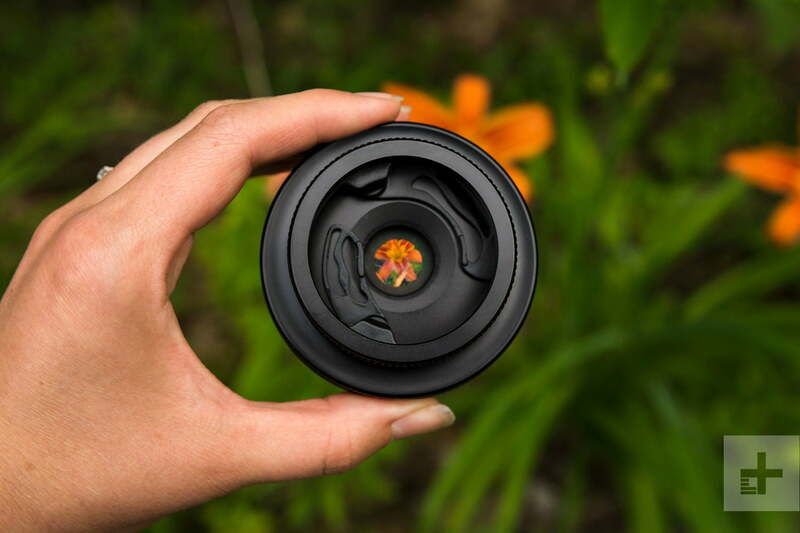 Lensbaby offers a one-year warranty on all lenses. The Lensbaby Sol 45 puts custom edge blur and textured bokeh inside an affordable, super small lens. The lens continues the brand’s tradition of perfectly imperfect images while vying for new-to-Lensbaby photographers with a low price. At $200, it’s hard to argue against it. Even if you only take it out of your bag every once in a while for a special shot, it would be worth it. Looking at a lens or filter designed to create a certain look begs the question: Can’t you just do this in Photoshop? First, Lensbaby is designed for getting creative effects in-camera, which is much faster than digital manipulation, though if you enjoy spending lots of time in Photoshop, the lens might not be for you. Placing a circular blur pattern over an image in Photoshop is fairly straightforward, but it won’t have have the same look, nor can you manipulate the blur patterns in post as easily as you can in-camera with the bokeh blades. Manual controls may be harder to use, but could extend the life of the lens. Without an autofocus system to worry about, the Sol 45 will probably stay relevant as long as the glass doesn’t scratch or break. 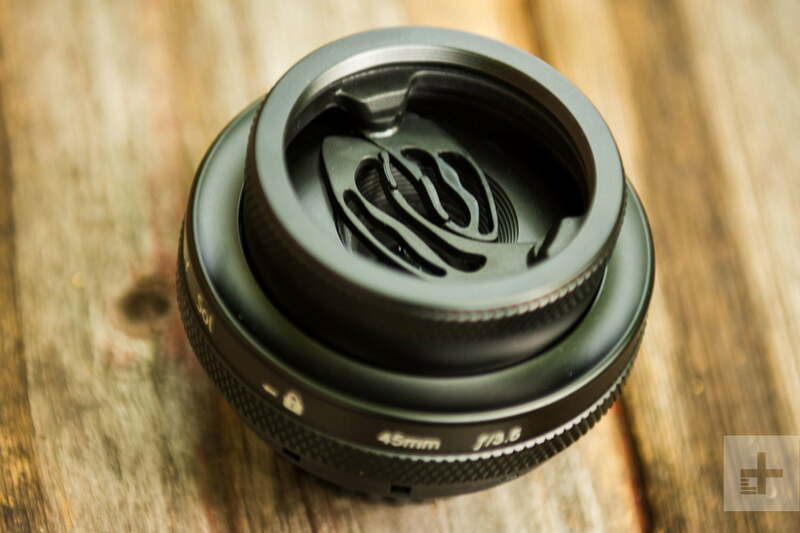 The ability to tilt the lens could potentially introduce an opening for dirt to get inside, but we didn’t encounter any issues during our review. If the lens is treated well, the Sol 45 should have a long lifespan. The Lensbaby Sol 45 creates a very specific creative look — using it as your only lens would be like only using one Instagram filter for all your photos; not a good idea. While the lens creates excellent creative blur, the Sol 45 look is too unique to use for every image. The manual focus also rules out any fast action, like photographing kids or sports, and the 45mm focal length is a bit of compromise between a good street photo length and a portrait length. For photographers that already have a few lenses in their bag but just want something different with intentional blur and a design that forces you to slow down and think about the process, the Lensbaby Sol 45 may be just the right tool. It is fun to use, has solid image quality, and sits on the very low end of lens pricing. While it isn’t suited for every shot, the Sol 45 offers a liberating, enjoyable shooting experience and may just whet your appetite for more advanced creative effects lenses.